Happy National Drink Your Veggies Day!! I’m starting my day out with a nice green juice. I have been trying to do green juice or smoothies 3-4 mornings a week and after this weekend’s festive Father’s Day event I am in desperate need of a nice green veggie juice. This week is all about eating our veggies so I also need to whip up another batch of Bloody Mary Hummus to have with veggies for healthy snacks in the house! Also honor of National Drink Your Veggies Day, you can also take part in this Naked Power Garden Sweepstakes. You can vote for your favorite Power Garden recipe for your chance to win a $250 garden gift basket. Oh did I mention that my Bloody Mary Hummus recipe is one of the recipes you can vote for? 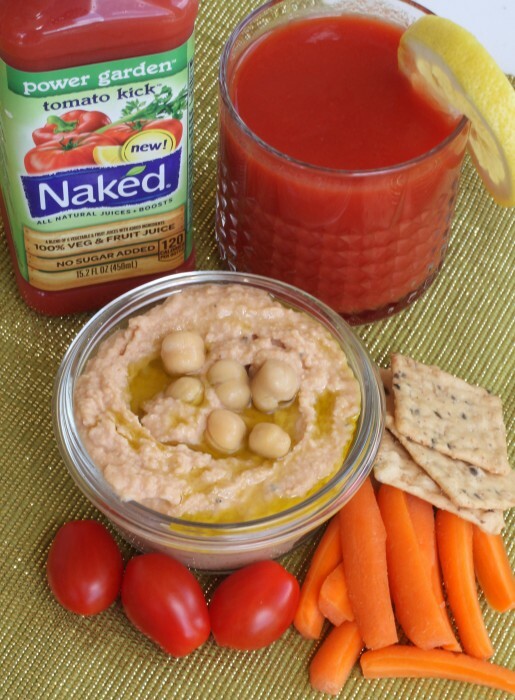 For a ton of great recipes using Naked’s new Power Up fruit and veggie blends head over to Glam Power Up Pinterest Board. How are you planning to celebrate National Drink Your Veggies Day? Power Garden is Naked Juice’s new veggie drink lineup with 1 pound of veggies in every bottle*. With delicious flavors that only Naked could blend, Power Garden offers one of the easiest ways to get your daily servings of veggies and fruits, along with good sources of fiber, vitamins and minerals. Learn more at http://www.nakedjuice.com/veggiedrinks.